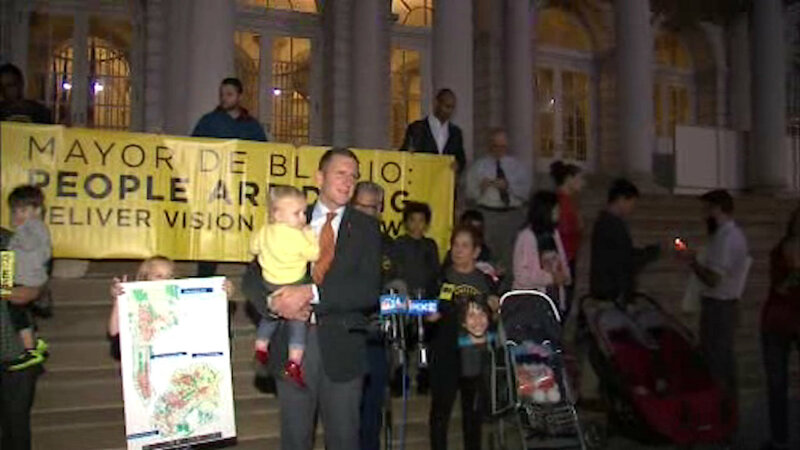 CITY HALL, Manhattan (WABC) -- Demonstrators took to City Hall to protest what they say are the shortcomings of Mayor Bill de Blasio's "Vision Zero" program. The protesters say that the program designed to reduce traffic deaths has veered off course. The group "Families for Safe Streets" is asking why most of the streets identified as dangerous "Vision Zero" priority locations have not yet been fixed. They say Astoria Boulevard, where a van backed into and killed a baby in his stroller last week, is one of those spots. Eyewitness News reached out to the city for comment, but we haven't heard back.